The migration of birds is one of the great spectacles of nature. It takes many forms, from large hawks circling high overhead to small songbirds making long, nocturnal flights. The migrating birds seen in and above West 11th Street Park during spring and fall migrations typically winter in Central or South America, and fly north in spring to breeding destinations stretching from Texas to northern Canada. In fall the birds return to their winter homes to the south. Spring migrants appear in the park from March to May; fall migrants, from August to October. The area near the mulberry tree on the east side of the park is one of the best places to look for migrating songbirds in the park in spring. 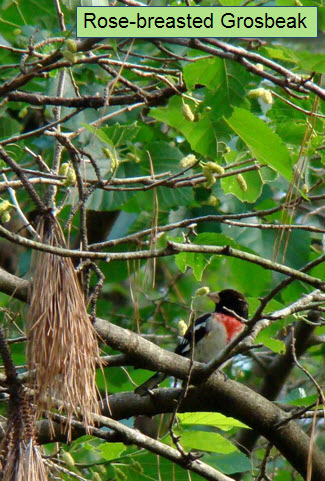 Many of the most interesting and colorful birds hungrily eat the mulberries to be found here. They include Rose-breasted Grosbeak, Summer Tanager, and Scarlet Tanager. 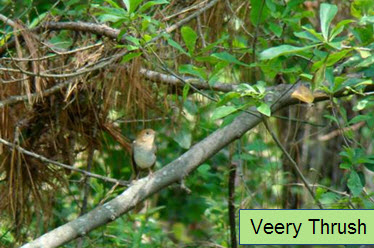 Two kinds of thrush, Veery and Swainson's Thrush, have been seen on the branches of the tree. Other colorful species, including Magnolia, Chestnut-sided, and Hooded Warblers, hummingbirds, and a female Painted Bunting have been seen nearby. Other good spots for spring migrants are in large deciduous trees on the south side of the park and in the trees and bushes around the Inner Loop in the interior. Above are birds that were photographed by Dr. Mark Kulstad in or near the mulberry tree on the east side of the park.